I'm all about authentic traditions, as long as they don't involve pools of grease and unethical amounts of sugar. Typically, the American classics (cheeseburgers, BBQ, pie...) don't get me going at all. It's hard for me to stir up any sort of allegiance or affection for a food that not only lacks any complexity in true herbs-and-spices flavor, but delivers heart attacks, blood sugar spikes, and the stereotypical American beer gut. When the only representatives from the redeeming parts of the food pyramid are a tomato-based sauce or a sugar-smothered canned fruit filling, how do we justify this as satisfying? (Judge me if you must.) I'll tolerate them if I have to, but I'd just rather not. But the all-American array of fall vegetables is quite a different story. Since they can be done deliciously and healthfully, and come with a good old dose of comfort and sentimentality (two of my love languages), I do get giddy about classic American fall food. I love eating "in season" foods, and I could consume Brussels sprouts, butternut squash, and pumpkin anything for every meal, all season long. Collard greens, cranberries, and apple cider never cease to thrill my heart, and make me proud to be an American. If you know me very well, you know I'm pretty adamant on preserving the cultural authenticity and consistency of foods in a meal, if I have anything to do with it (i.e., making fettucine and serving it with a real Italian salad, not iceberg and Ranch... serving sushi with Japanese miso soup, not Chinese eggrolls...serving hummus with pita bread, not potato chips). I know...I know. But it's just how I'm wired. Really, I'm not trying to be difficult. If you're a real-life friend or relative with whom I have meal-planned or cooked with in the past, I probably owe you a real-life apology. I'm trying to get better at not making mountains out of culinary mole hills - really I am. I am making progress though. Case in point: this dish. Even though it initially grates on my "this isn't how traditional ______ food is supposed to be" nerve, once in a while I find an intentional fusion of cuisines that I fall in love with after the first skeptical bite. And this recipe in particular, is one of them that I've found worthy enough to repeat year after year. 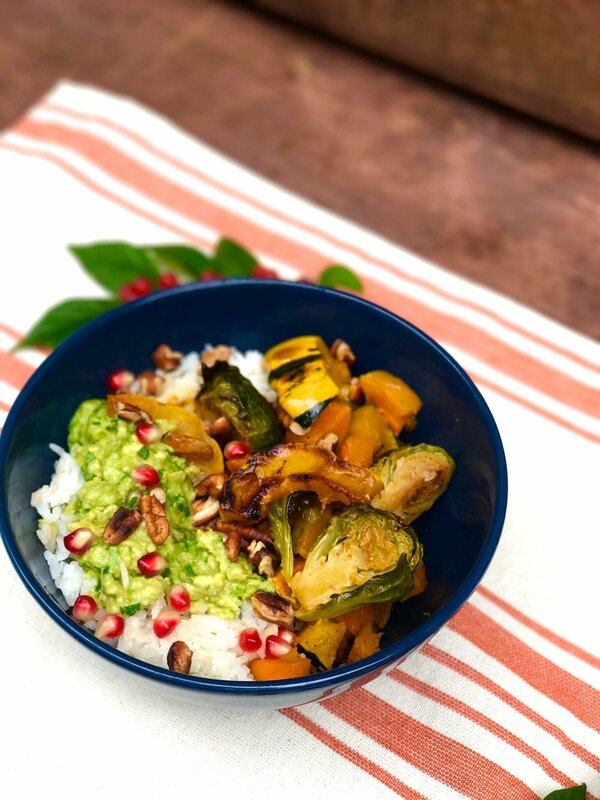 Have you ever thought to pair the Thai trio of curry/coconut/jasmine rice with American fall vegetables, then to smash a Southwestern fruit/veggie like avocado, and sprinkle on the seeds of a Middle Eastern superfruit? Neither had I, before I started pinning recipes from the most amazingly gifted, foodie creative and blogger/photographer I have ever encountered: Tieghan Gerard from Half Baked Harvest. I don't even have words the beauty that resides on her corner of the world wide web. Even if all you do is "window shop" through her photography, it is well worth your time. She is young, inspired, and unapologetically devoted to the profession of crafting incredible edibles and displaying them as art to the world. She has become my prime inspiration and role model in the world of food blogging. Unlike her photography, mine totally lacks the ability to capture the orchestra of textures, colors and flavors in this dish....so just check hers out instead. Her bowls are to die for. No one else concocts such unique combinations of flavor-packed foods. No restaurant, no magazine, no Food Network show, and no other food blog I've encountered has matched her level and style (and I've been a consumer/critic of all the above for 13 years running). Either they're way too complex, not practical enough to make on a weeknight, or just not awesome-tasting enough to write home about. But her stuff is different. Stay tuned for more of my blog posts featuring her creations. For all of our married lives, my best friend and I have had THE biggest foodie crush on her. Whenever some outstanding, effusive blend of flavors and cuisines takes its place as the star of the dinner table, our husbands always say, "WOW. This is a Half-Baked Harvest recipe, isn't it?" And they are always right. Her photography on her Roasted Harvest Veggie, Curried Avocado + Coconut Rice Bowls post puts my iPhone imagery to utter shame (which I'll be the first to not just admit, but to proclaim). So I urge you to go check her out. For all she's contributed to my kitchen life, I feel I owe her my allegiance and my own readership, though my blog following may be small. It may seem like a lot of ingredients, but if I can do it in all my last-minute cooking glory, you can too. Even if all you've got are the ingredients in the pictures below (that is, leaving out things like coconut water, coconut flakes, blue cheese, and pomegranate seeds), you still will have a wonderfully flavorful bowl to savor and marvel over. But if you've got the flavor-explosion cocktail of extras, add them to the mix and you will remember the moment you first tasted this dish forever... with or without documenting it on instagram. Unless you're a vegetarian, add some rotisserie chicken to the mix and you'll have plenty of protein and seasonal indulgence to satisfy you til tomorrow afternoon. Each time I make it I'm surprised at how filling this bowl is. So take the opportunity to cut back on the rice and pile up those Brussels sprouts! Directions: Click here to read the recipe on Half-Baked Harvest!